How did you get into fitness? I served 20 years in the US Army and running was not only a part of being a Soldier, but also became my passion. After retiring almost 5 years ago, I continued to run. Favorite thing about Fleet Feet Sports: The shoes - and the training programs! Fun fact: I completed my first half marathon at 43 years old! How did you get into fitness? I started into fitness in 2008 after I got married. Before then, I didn't exercise much. I fell in love with fitness after joining a bootcamp - so much so that I studied to become a personal trainer and I now own my own fitness company! Favorite thing about Fleet Feet Sports: The individual attention and the fact that they take my individual needs into consideration! Favorite post-race meal: I LOVE my vanilla protein shake! Fun fact: Years ago I made jokes about starting my own fitness business. This was before I had event thought about becoming a CPT. The end of 2013, I officially opened my business and have been having so much fun with it! I also HATE running but I do it and encourage others because it is good for me! How did you get into fitness? I have always been active beginning with playing lots of sports growing up. That progressed to a lifetime of gym memberships and various classes from aerobics to hot yoga. Over the last couple of years, I became interested in running, signed up for the No Boundaries: Couch to 5K program and now I am a RUNNER! 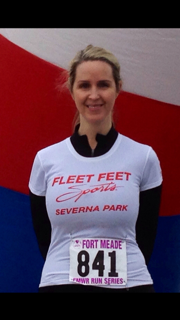 Favorite thing about Fleet Feet Sports: The people and the overall "vibe"
Fun fact: About 15 years ago, I was a real estate agent in the Annapolis area. I sold houses to four registered nurses in a row, and became convinced that nursing was my calling, and went back to school for my nursing degree. No regrets! How did you get into fitness? I started working out in college in ROTC. I really started to enjoy running and participating in races after I moved to FL in 2003 and haven't looked back! Favorite thing about Fleet Feet Sports: The friendly staff, and the variety of products, demo runs and seminars.